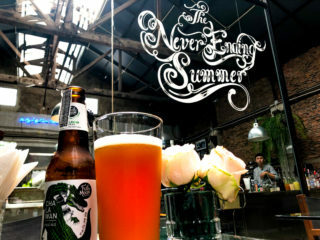 BE Collective’s MD, John Tuxworth recently caught up with ‘Starchitect’ Duangrit Bannag, at Duangrit’s Bangkok restaurant, The Never Ending Summer. The pair only had a short time together to discuss multi-disciplinary design (a mutual passion), and current project works. Kuhn Duangrit is busy. Very busy. His practice, Duangrit Bannag Architect Limited (DBALP) is located at the Jam Factory, Duangrit’s own development. Situated on the south bank of the Chao Phraya River, the previous industrial site now houses Duangrit’s restaurant, coffee shop, book shop homewares store – Any Room, and hosts a variety of events in the beautiful courtyard and boardwalk areas. Since John’s last visit in 2016, Duangrit has opened a 2nd restaurant on the site, The Summer House Project – and in 2018 his DBALP Consortium won the design for the new THB35 billion (AUD 1.5 billion) terminal at Bangkok’s international airport. Duangrit is an inspiration, and John is looking forward to catching up again when the pair have a little more time.